The winners of the Pantaloons Femina Miss India (PFMI) 2012 pageant were declared at a star-studded event at Bhavans Ground, Andheri on Friday evening. Chandigarh girl, Vanya Mishra who got a direct entry in the final 20 after winning Dabur Gulabari Miss Rose Glow 2011 contest is finally PFMI'12 Miss World. In answer to the final question, 'If you have an option, will you create thousand jobs or feed thousand children daily?' Vanya said, "Little children are innocent and anybody's heart will melt. I will also try to give them education so that they can feed themselves and their family too." 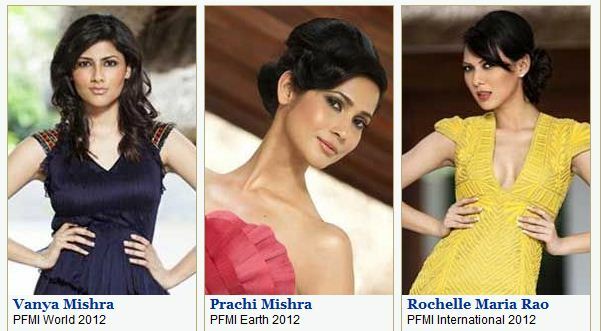 The PFMI 2012 winners were crowned by Pantaloons Femina Miss India World 2011 Kanistha Dhankhar, Pantaloons Femina Miss India Earth 2011 Hasleen Kaur, Pantaloons Femina Miss India International 2011 Ankita Shorey. Mr Kamal Basu, Head Marketing Skoda Auto India Private Limited, gave away car keys as part of grand prize to the three finalists. Congratulations to all three winners who managed to win a difficult contest. There is so much media scrutiny on this contest in India. Because of past winners (Sushmita, Aishwarya, Priyanka, Lara....) we have very high expectations from this beauty pageant.